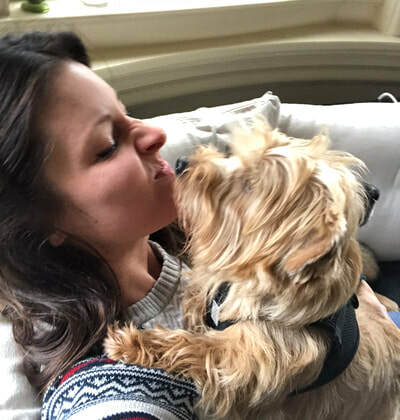 Anne Marie... "The Puppy Au Pair is the realization of dream for me and the best decision I've ever made. After nearly a decade as a project manager in the event marketing industry, I found myself on the business end of a life changing car accident. This, coupled with a milestone birthday and an unfulfilling career...I was doing some serious re-evaluating…What would make me genuinely happy? The answer was so simple, yet somehow I hadn’t recognized it until life made me. Since as early as I can remember, I’ve loved animals. My first best friend was Smokey, the family rescue schnoodle. Our house had every type of pet imaginable at one time or another: from lizards and bunnies to the occasional stray pup or cat that needed a stopover on its journey back home. The place I went as an adult that brightened my day without fail was the dog park (even before I had a dog of my own). I devoured books about amazing dogs and fascinating animal behaviorists. I found a peace and a joy in being with dogs who live in the moment, appreciate even the smallest things, and never fail to make us laugh. They’re inspiring really and the cheapest life coach you’ll ever find! I wanted to wake up every day happy to go to work and maybe even find a way to give back to the animals that make our lives so much better… so The Puppy Au Pair was born. And when you're doing what you love and doing it well, I guess things fall into place! Before I knew it, The Puppy Au Pair was growing and I needed talented passionate animal-lovers working by my side. I searched high and low, going to great lengths to find like-minded, fun, genuinely caring and responsible puppy au pairs for this awesome adventure. I feel so lucky to call these amazing people my pack!"